Easy to make and the perfect size for breakfast! Whisk/sift together flour, salt and pumpkin pie spice. In the bowl of a stand mixer, whisk together the water, Red Star Yeast and 2½ tablespoons sugar. Allow it to proof for 5 minutes. Add the sweet potato puree and mix it into the liquid using a dough hook and then add the flour mixture. Mix on low speed for 5 minutes and then turn the speed up to medium and allow it to mix for an additional minute. Lightly grease a baking sheet. 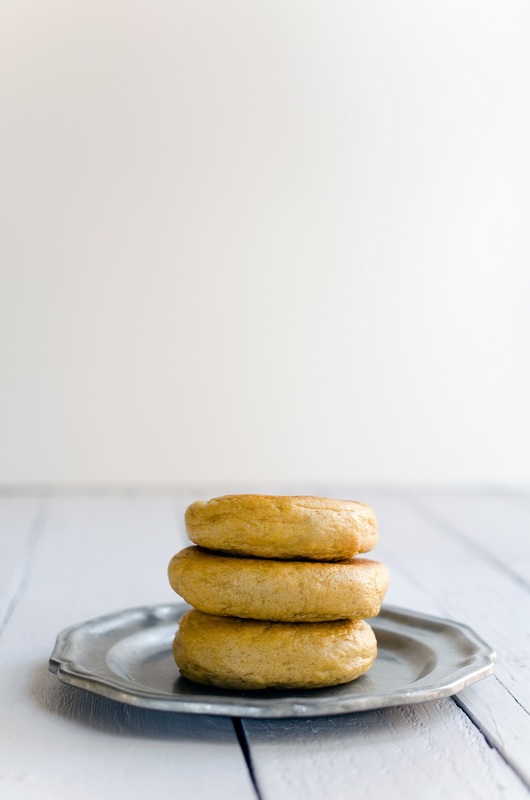 Using a kitchen scale, measure out 2 ounce balls (these will make small bagels compared to what you would buy in a store. For a more traditionally sized bagel, aim for 3.5 ounces). Roll each ball into a 5-inch log. Join the ends and firmly pinch them together. Once all of the bagels are rolled out, let them rest for an additional 20 minutes. Preheat the oven to 400°F and bring a large pot of water to a boil with ½ tablespoon of sugar. Grease a baking sheet and set aside. In batches, boil the bagels for around 30 seconds per side. You can purchased canned sweet potato puree but it's very easy to make fresh: Use a fork to poke numerous holes in the sweet potato, place it in a microwave-safe bowl and cover it with a damp paper towel. Microwave for 3 minutes, flip the potato and then microwave for another 3 minutes. Allow to cool and then slice in half and scoop out the softened sweet potato with a spoon. Puree in a food processor.